During a walk in my local wildlife garden we noticed the first Cinnabar Moth (Tyria jacobaeae) caterpillars of the year, and an adult also flew by. 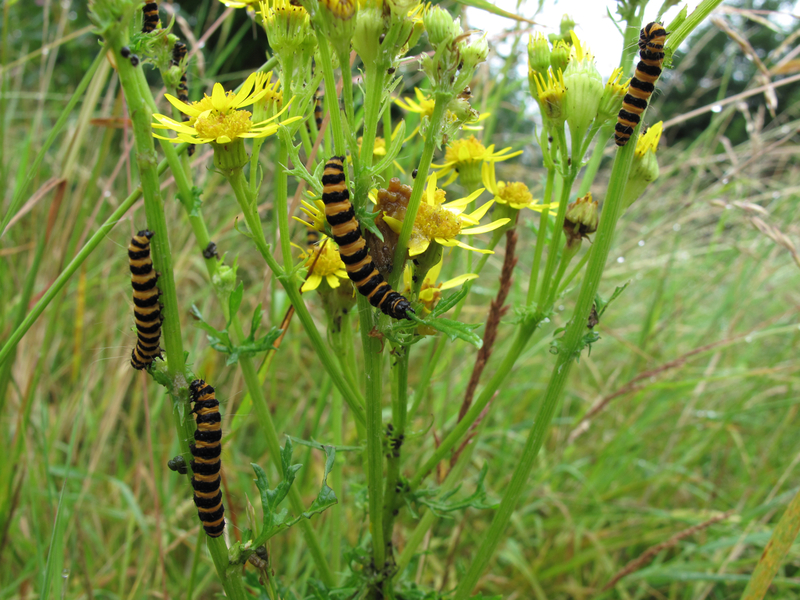 The caterpillars clustered at the flower heads of Ragwort (Senecio jacobaea), which they prefer as food, and had defoliated the plants quite a bit. Many had already left in search for greener pastures and were around the ground or wandering over other plants. 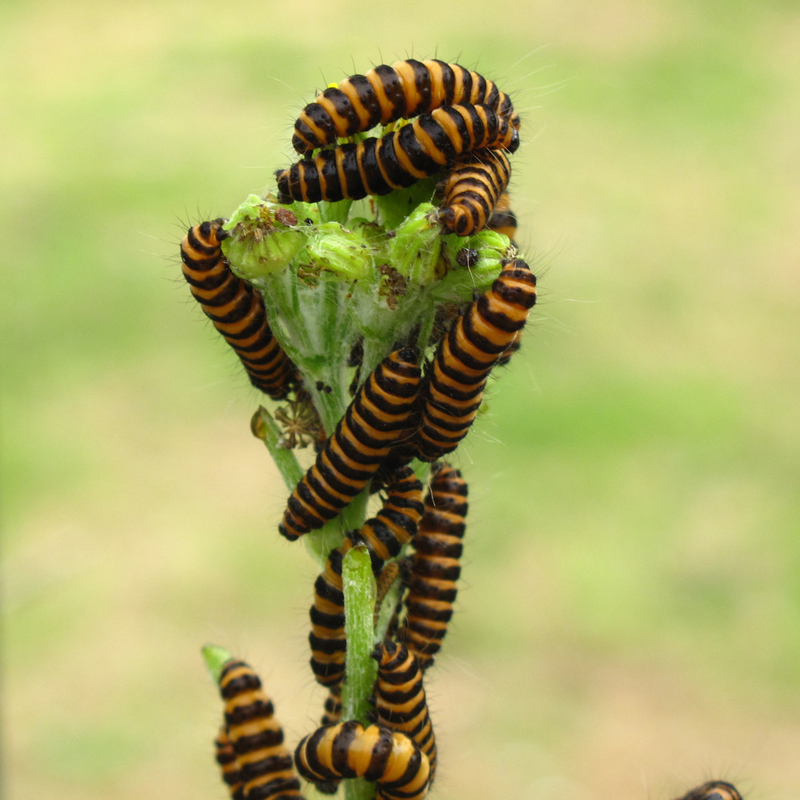 Cinnabar Moth caterpillars have a strong tendency to cluster together, an antipredator behaviour. This behaviour , however, gradually dissapears as the larvae grow so that fully grown fifth instar larvae are actually agressive to each other and tend to be found spaced out in the plants. Adults emerge in late spring from overwintering pupae and after mating, female lay eggs in the basal leaves of ragworts. Larvae hatch in about two weeks and their development takes about one month, after this, they pupate on the ground and remain in diapause until the following spring. This moth is often active by day and therefore easy to spot due to its contrasting coloration, but they are most active at dawn and dusk. When they fly, their pink hindwings are quite apparent and they can be taken for some exotic bright pink butterfly. The bright colours of the moth and particularly, the striking yellow and black stripy pattern of the larvae are a warning sign of their distastefulness to vertebrate predators, a phenomenon called aposematism. The larvae ingests and stores in its tissues toxic alkaloids from the foodplant and the adult also synthesizes additional toxins itself. Surprisingly, many invertebrate predators feed on eggs and caterpillars of this moth. Given that Ragwort is a toxic plant for horses and has been introduced in several countries where it has become an invasive weed, a lot of effort has been directed to study the ecology of the Cinnabar Moth as a way of controlling Ragwort. Thank you Jay! I am glad it was informative. I have never tried to keep them, but I think after reading your post you guys probably got a large caterpillar ready to pupate. I would try and find small ones next year to show the kids how much they eat and how fast they grow. I've found some caterpillars from ragwort that has been pulled and is ready for burning. Now how do I help them survive so they can eat more ragwort - a breeeding program would be good. 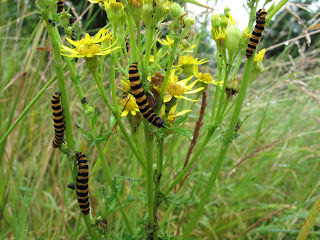 We're overrun with ragwort now, and there are very few caterpillars. I remember there being loads of caterpillars and them stripping whole plants of ragwort. 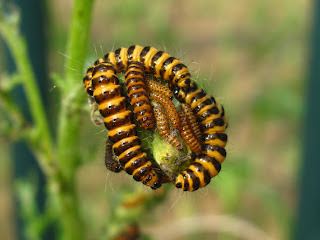 i found some of these caterpillars on some ragwort by the beach, i took them home and i am now waiting for them to pupae. they also eat common groundsel but they prefer ragwort. its a shame they take a year to evolve but its worth it when youve got a ragwort infestation! This creature is destroying my Sandal wood tree leaves. What should i do? Is it dangerous to tree growth ? Hi. We keep finding the same looking catepilcater in our home. Any ideas why they going in? We have no idea where they coming from as we don't have big garden or loads of plants arroun. I never seen them in the garden before. Any ideas whtthats happening and how to stop them from going in? You don't have to travel far to marvel about the natural world. Extraordinary animals with fascinating behaviours live around us in our homes, gardens and cities. 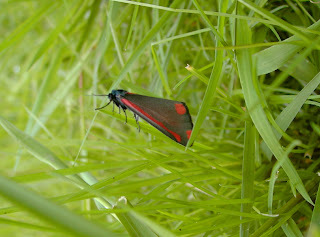 This blog is a venue in which I showcase research or curious facts or observations on insects and other invertebrates I come across, mostly in and around my garden in the UK. All photographs and text in Bugblog unless otherwise stated are licensed under a Creative Commons Attribution-NonCommercial 4.0 International License. You are welcome to use them for private, educational or other non-commercial use, provided you acknowledge their source (a link to Bugblog or my name will do). Although not necessary, I appreciate if you let me know you are going to use them. © Blackbird. Simple theme. Powered by Blogger.